We have some very good news for Adguard for iOS users, and we know there are plenty of them out there. A new version came out today, and the most noticeable novelty of this release is a manual element blocker. Those who are familiar with Windows and Mac versions, or even Adguard browser extensions, already know about Adguard Assistant and browser extension element blocker, and how handy can it be sometimes. And if you still have no idea of what it is – don’t worry. We will explain it in just a couple of moments. Basically, it is a tool to block any element on the page, from a rare missed ad to generally anything you just don’t want to see on the page for some reason. To block/hide this element, open Adguard from ‘Sharing’ menu. 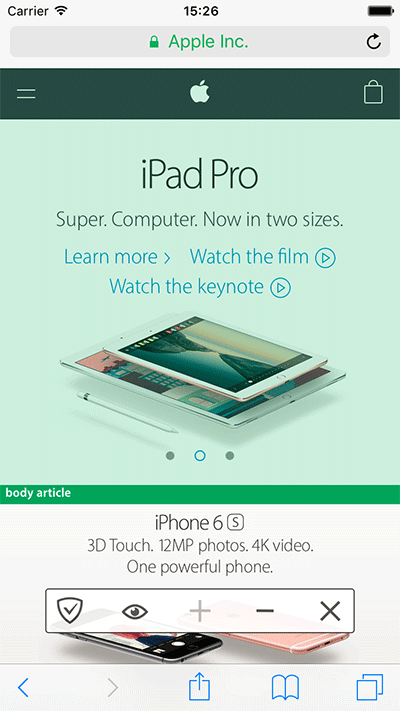 Choose ‘Block Element On This Page’ and then select an object on the page you want to remove by tapping on it. You will be given an option to adjust the frame size by tapping +/- buttons, as well as an ability to preview changes by tapping on ‘eye’ icon. Tap Adguard icon to confirm changes. 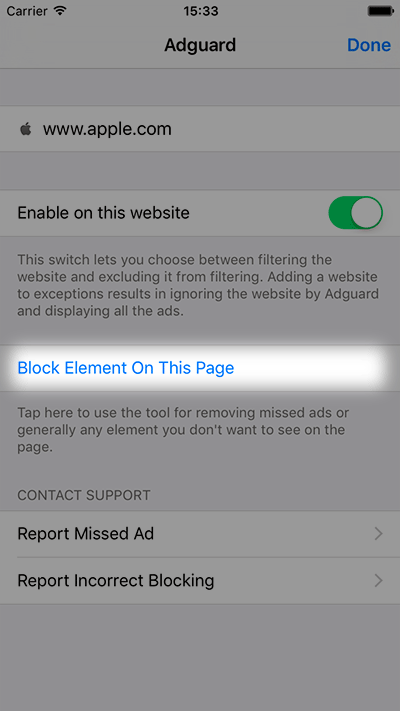 Then, tap ‘Open’ to agree to go to Adguard and to save and enable the new rule which will block the selected element. Or simply just watch our tutorial video on the new Assistant and how to use it. Previous update, v.1.0.5, brought many changes to background update process, but there were some problems left on particular devices. They should be fixed now with the release of 1.0.6. We remind you that you can download Adguard on iTunes, just click on this link. We hope that you will like the new Assistant feature. Post your thoughts and impressions in comments section! Why people are still not blocking ads? The reason is quite funny: because they simply don’t know that they can actually do it.